Transforming smiles is the focus of cosmetic dentists everywhere. But, with so many cosmetic therapies available, which is right for you? If you are looking for a solution to discolored, chipped, or misshapen teeth, porcelain veneers might be the right option for you. Veneers can be thin sheets of porcelain ceramic or painted-on composite resin material that bond to the fronts of teeth.. They are an aesthetic solution to minor dental issues such as crooked teeth, misaligned teeth, uneven size or spaces between teeth or severely discolored teeth color damaged. Both composite and porcelain veneers improve appearance. However, depending on the desired outcome, the differences between the two can be significant. Porcelain veneers are known to produce beautiful, natural-looking smiles. Although more expensive than composite veneers, they can last longer. Porcelain veneers are available at the Marler Campbell Dental Group in Escondido for patients seeking a complete smile transformation. Although the layers of porcelain material are only about .5-.7 millimeters thick, once bonded to the tooth structure, they become strong and are more resistant to chipping than composite veneers. Porcelain veneers are not porous or impervious, and will resist stain. In fact, tea and coffee lovers might want to opt for porcelain precisely for its stain-resistant properties. Porcelain veneers create a very natural-looking smile – the material itself closely resembles that of the natural tooth, both in terms of color and luminosity. Its life-like properties means porcelain veneers are virtually indistinguishable from the natural tooth. Both porcelain and composite veneers offer options for patients in need of mild to moderate cosmetic improvements. We encourage our patients to schedule a consultation with our office to determine which solution will work best for them, depending on lifestyle, desired outcome, and budget. If you feel you may be a good candidate for porcelain veneers, or want more information, call the Escondido office of Dr. Kurt Marler and Dr.Jon Campbell today and schedule an appointment. We look forward to transforming your smile! Why are Root Canals Done on Baby Teeth? Endodontics is the area of dentistry concerned with dental pulp – the soft central part of a tooth. Although root canals are usually sought out by adults, children can benefit from this therapy as well. The desired end result of any root canal therapy is a tooth that is free of infection and decay – even if that tooth is a baby tooth. How long before that tooth falls out naturally? How much damage is there? Has the surrounding bone or gum been damaged? Baby teeth do fall out naturally, but that doesn't mean its okay to extract an infected baby tooth without just cause. In fact, because of the success of root canal treatments for children, most teeth can be saved and still function until the adult teeth come in and naturally push the baby tooth out. The treatment involves removing all of the pulp and thoroughly cleaning the inner portion of the tooth. Once clean, the dentist fills the empty space with a special material called gutta-percha. The tooth is then capped with a stainless steel crown in order to protect it. Depending on the tooth’s location, the crown can also be covered with a white, tooth-colored material for a more aesthetic result. It is very important for the child to continue a regime of regular brushing and flushing to prevent any new oral problems. Depending on the severity of the case, root canal therapy may take more than one visit. Your family dentist will speak to you about your child’s oral health and the treatment plan to correct it. If your child has been complaining about a tooth ache for more than a few days, or has suffered a dental emergency, contact The Marler Campbell Dental Group to schedule an appointment. Primary teeth are important to the development of your child’s long-term oral health. Our family dental practice in Escondido dedicates their services to patients of all ages. An ounce of prevention is worth a pound of cure, and preventive measures can be lifesavers when it comes to dental health and wellness. Dental caries – otherwise known as tooth decay – are one of the most common, preventable conditions among Americans of all ages. Tooth decay causes the erosion of the tooth's enamel; bacteria in plaque produce acids which attack the enamel, causing it to break down. But, with a little effort, the following tips can help anyone avoid the pain and discomfort caused by tooth decay. Supplemental fluorides can be used to strengthen teeth. Fluoride is a mineral found in naturally in the earth, and artificially in drinking water. It can protect against tooth decay by strengthening the enamel, resisting acids, and preventing erosion. Fluoride is found in toothpastes, mouth rinses, and in therapies provided by your dentist. Dental sealants are a protective coating that is applied to the surface of the premolars and molars in the back of the mouth, where decay often starts. Sealants are painted onto the tooth enamel where it bonds, forming a protective shell, keeping food and bacteria out of the tooth's crevices. Brushing and flossing regularly are two of the most effective at-home methods of fighting tooth decay and gum disease. Debris can be removed from teeth by thoroughly cleaning the surface of the teeth and gums at least twice a day. Flossing will remove food particles found in between the teeth and along the gum line. Dentists are able to provide guidance and instruction on how to properly brush and floss – be sure to ask for a demonstration if needed! You are what you eat, and in the case of dental caries, sugar and acids contribute to bad bacteria thriving. Eating a nutritious and balanced diet, limiting snacks and sugary foods, and avoiding carbohydrates that break down into sugars will help avoid tooth decay. If eating snacks or sugary foods is unavoidable, brushing afterward helps to remove the bacteria that has settled on your teeth and gums. As effective as all other solutions may be, the best thing for teeth is a professional cleaning and examination. Dentists are able to remove surface plaque and tartar from the teeth and gums, and they can spot any developing issues before they become problematic. In addition to preventing and spotting dental caries, an oral exam allows dentists to look for signs of other illnesses, including gum disease and cancerous lesions. Contact the Marler Campbell Dental Group with any questions regarding preventive care, tooth decay, and your dental care plan.The family dental practice accepts patients in and around Escondido, CA. Straight teeth not only look more attractive, but a normal, healthy bite can mean so much more! In fact, correcting misaligned or crowded teeth can help prevent decay and gum disease. Traditional straightening devices have significant drawbacks and alternatives like ClearCorrect have become a more popular choice for older teens and adults. ClearCorrect aligners are an alternativesolution to metal braces for straightening teeth. Made in the U.S. A., ClearCorrect offers patients the ability to get on with their normal daily activities while invisibly correcting their smile. Patients at the Escondido office of the Marler Campbell Dental Group are offered ClearCorrect as an orthodontic solution to adjusting crooked and crowded smiles. ClearCorrect can address crowding, gaps and spaces, over-bites and under-bites, as well as crooked and slightly rotated teeth. 1. Appearance – The name says it all! ClearCorrect are clear plastic aligners that realign the teeth without the added discomfort of being visible. No need to hide bulky metal hardware and wires, which often cause discomfort; ClearCorrect aligners are virtually invisible to others, and patients feel less self-conscious. ClearCorrect is ideal for teenagers and adults who are concerned with the appearance of traditional braces. 2. Convenience – with ClearCorrect braces, patients enjoy quality dental care without sacrificing their normal daily activities. Unlike traditional braces, aligners are removable, which means patients can eat all the foods they would normally without restrictions. And after eating, patients can brush and floss normally without navigating brackets, and wires, to remove food buildup and other detritus. The aligners are easily fitted, and new sets replace the old every six weeks or so. The plastic allows for greater comfort, and patients avoid cuts to the gum and mouth as happens with traditional devices. 3. Long-lasting Results – ClearCorrect helps patients avoid long-term health problems. After treatment, patients usually discover an improvement in the way their teeth function – not to mention less food getting caught between their teeth! This is great news for their health and well-being, since food build up results in more plaque, which subsequently leads to a greater incident of infection and gum disease. Correcting overcrowding also means teeth enjoy the proper amount of bone support, and less potential damage to neighboring teeth and bone. ClearCorrect offers patients a straighter, healthier smile that can last them a lifetime! If you feel you might benefit from ClearCorrect, contact the Marler Campbell Dental Group today and we will happily schedule you an appointment. Our office is conveniently located in downtown Escondido. TheMarler Campbell Dental Group is a multilingual office; we welcome patients from Escondido and surrounding areas. Many of us are familiar with the idea of establishing proper dental hygiene habits – brushing, flossing and regular checkups – are necessary to prevent gum disease and tooth decay. But what does that actually mean, and is it really that important? Well, the short answer is yes, it is important. But not just for the reasons mentioned. Healthy teeth and gums are definitely vital to our oral well-being, but routine dental care offers more than just avoiding rotten teeth and cavities. It might just save your life. Nowadays, many dentists emphasize the importance of preventative care to patients of all ages. That is, dental care that prevents the development and spread of disease and disease-causing bacteria. Brushing and flossing twice daily are at the top of the list of preventative measures, which can also include antibacterial mouthwashes and rinses. Regular checkups usually involve an oral examination during which your dentists examines the mouth, teeth and gums, looking for trauma, inflammation, broken teeth, or damage to existing fillings. Dental x-rays are taken so that any internal issues can be identified. Regular dental care means whole-body wellness. Much research has been done surrounding the link between dental health and medical issues, such as diabetes and heart disease. Many conditions can be identified through an oral examination. Besides tooth and gum problems, your dentist is also looking for signs of other illnesses including diabetes and cancer. Bacteria from untreated gum discolored can spread infection to other parts of your body. Gum disease can create additional issues for people with diabetes as severe periodontal disease can lead to increased blood sugar levels making diabetes much harder to control. Pregnant women are susceptible to effects of gum disease and infection. Babies born to women with periodontal disease have an increased chance to be born too early or smaller in size. Routine dental care can also be better for your wallet! Preventative care and dental checkups can help prevent worse conditions from developing, whereupon more intrusive, complex and expensive treatments are required. Avoiding costly deep cleanings, or tooth replacement is a benefit few of us can literally not afford to ignore! The Escondido dental practice of Dr. Marler and Dr. Campbell recommends that patients should visit their dentist every six months for a checkup. Contact us today to find out how we can help you attain the best in overall health and well-being or schedule your next appointment. Living without teeth presents multiple challenges – eating, biting, and speech are all affected by tooth loss along with premature facial aging, digestion and jaw bone loss. Dentures are the most common means of addressing tooth loss. As great as they are, dentures are known for presenting their own set of problems. They can be ill-fitting, poorly customized, loose and painful. Thanks to technological advancements, it doesn't have to be that way. With implant-supported dentures, patients enjoy not only a new smile, but also a new lease of life. The doctors at MarlerCampbell Dental Group recommend implant-supported dentures for qualified patients at their Escondido practice. Dental implants support dentures by providing a stable base that is not only permanent, but also becomes part of the actual bone structure. This happens when the titanium posts used in implants fuses to existing bone through the process of osseointegration. The implants take the place of the natural root, and preserve the remaining bone and facial structure, reestablishing any lost lip and mouth support. Implant-supported dentures allows patients to assume their normal daily activities, diet, and oral hygiene routines. Mouth function is maintained, so foods can be fully enjoyed without bite and chewing interruptions created by ill-fitting dentures. Speech troubles disappear. Patients can rely on the strength and durability of the materials used. Supported or Retained – What’s the difference? Over-dentures (implant retained dentures) are removable, which allows for thorough regular cleaning. Routing at-home care helps prevent a buildup of disease-causing bacteria and promotes good dental health. Because these dentures are removable, there are small gaps between the plate and your gums giving bacteria access to the gum line. Many patients prefer to use retained dentures knowing that they won’t have to go to the dentist to get their teeth clean. Fixed dentures (implant supported dentures) function as regular teeth and can only be removed by the dentist for a complete cleaning. Patients who choose this option appreciate a more traditional brushing regimen. Because these dentures are more securely fastened, there is minimal gap for bacteria to enter and routine cleanings at the office maintain great oral health. Dr. Marler and Dr. Campbell educate their patients so they are prepared to make the best informed decision. It is important to know all of your options before the treatment plan is created. Talk with your dentist to find out the pros and cons to each set of dentures. Don’t be afraid to ask questions, they are there to help you. Contactthe Marler Campbell Dental Group in Escondido today and ask about the advantages of implant-supported dentures. 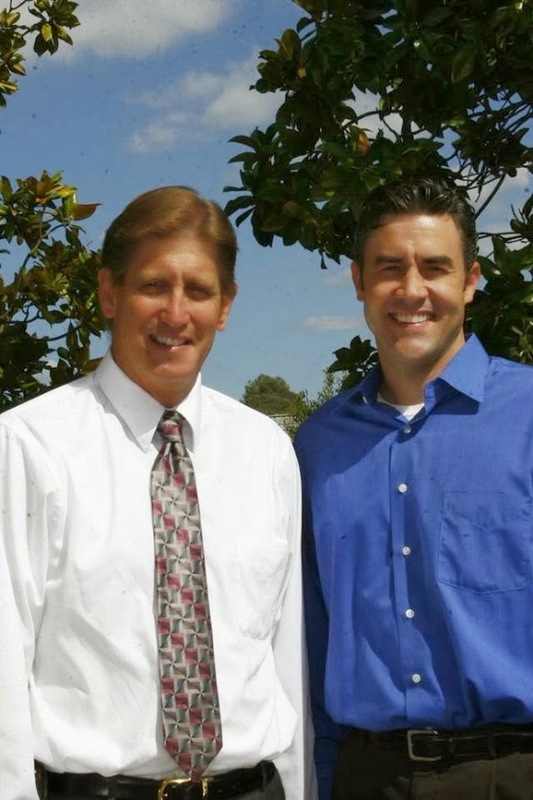 Dr. Kurt Marler and Dr. Jon Campbell are looking forward to giving you a better quality of life, and a healthier smile! Welcome to our Marler & Campbell Dental Group blog! We're excited to announce the official launch of our Marler & Campbell Dental Group blog. If you would like to stay up to date on the latest from Marler & Campbell Dental Group, simply click the RSS “Subscribe to feed” link located on our website and subscribe. Our subscribers will be updated when we make a new blog post.